This post is a bit of a cheat. I forgot to take photos of my most recently completed project before I gave it as a gift*, so instead I’m going to tell you about a few projects I have underway that I’m planning to complete very soon. 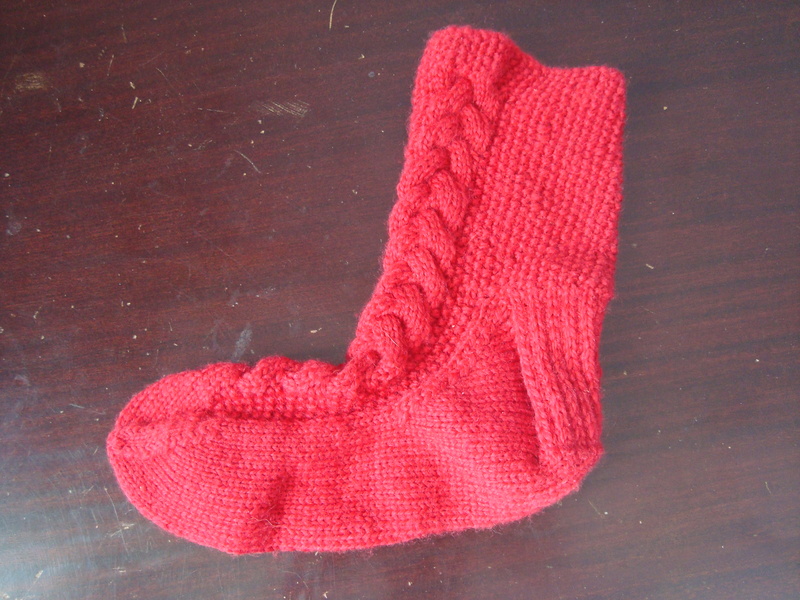 The first is a pair of Christmas socks. I’ve completed the first sock and it’s gorgeous. 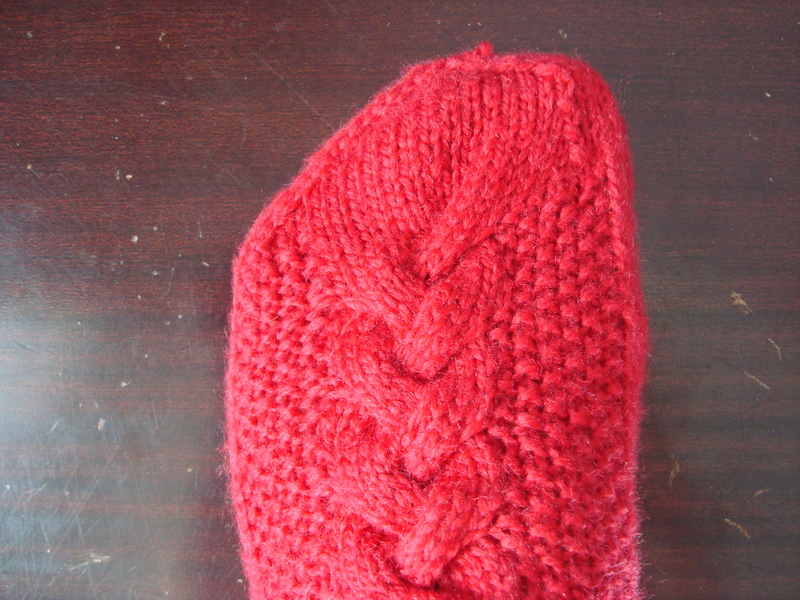 Bright red and super snuggly in moss stitch with a braid up the front. 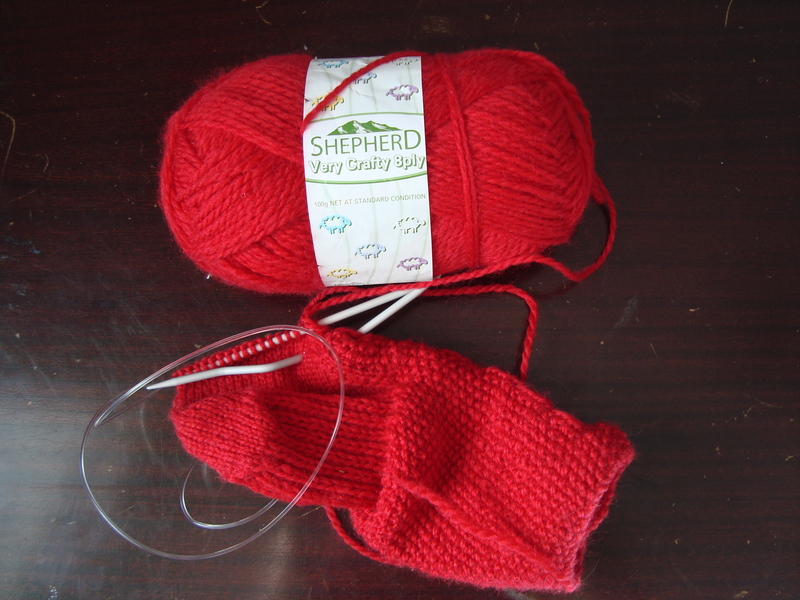 I had intended to have both socks all finished, wrapped up and placed under the tree for Christmas morning. Sadly, I’ve been struck by second sock syndrome and this is what the remaining sock looks like today, over a month after Christmas. I thought I would also tell you about a few other projects that I have on the go and hope to complete very soon. I have to confess that this is only a small selection. I definitely enjoy planning and starting projects more than I enjoy completing them, and I have the terrible habit of getting distracted planning the next project while I’m in the middle of a current one. I don’t think I’m unusual in this though. Every crafty person I know seems to have a big pile of materials to make future projects, as well as a hidden stash of unfinished projects. But… it’s so satisfying to finish making something beautiful, so I thought exposing these unfinished objects to the world might be what it takes to motivate me to complete them. 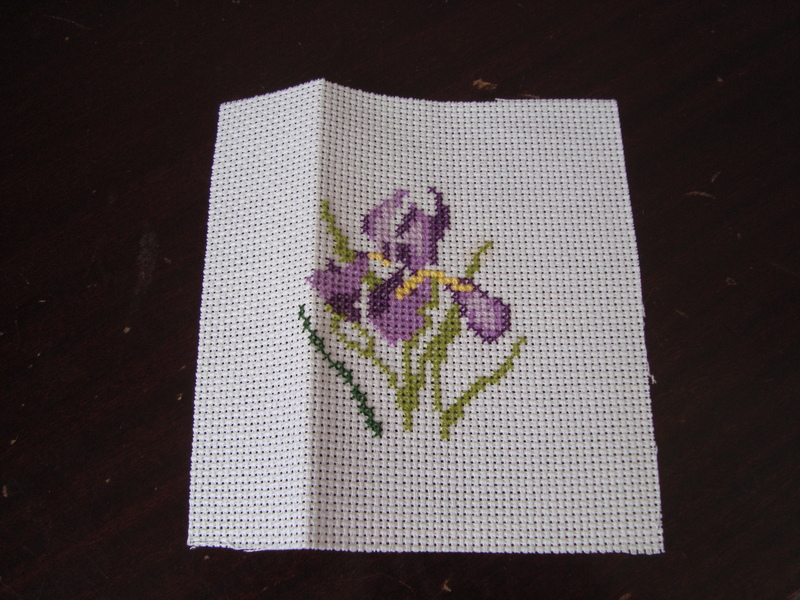 The first is framing this little cross stitch. It’s so pretty, and came from a little kit that my Nana gave me for Christmas years ago. 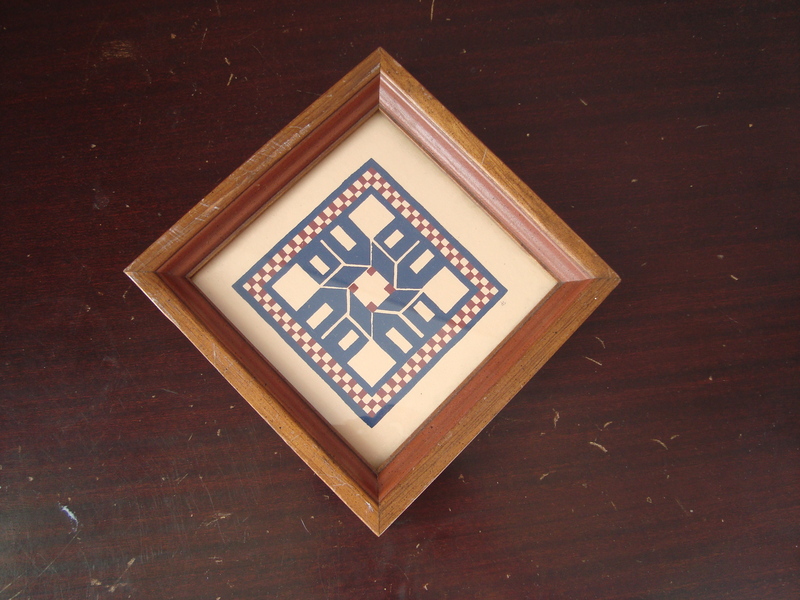 I did the cross stitch several years back, but then popped it in a drawer and only came across it again recently. I’m planning to put it into this frame, which I bought second hand from the local Saint Vincent de Paul store. I want to give the frame a light sand, then paint it white with some light distressing. I’ve never tried distressing before, but there are lots of examples on this site, which I absolutely love, and it looks pretty simple. 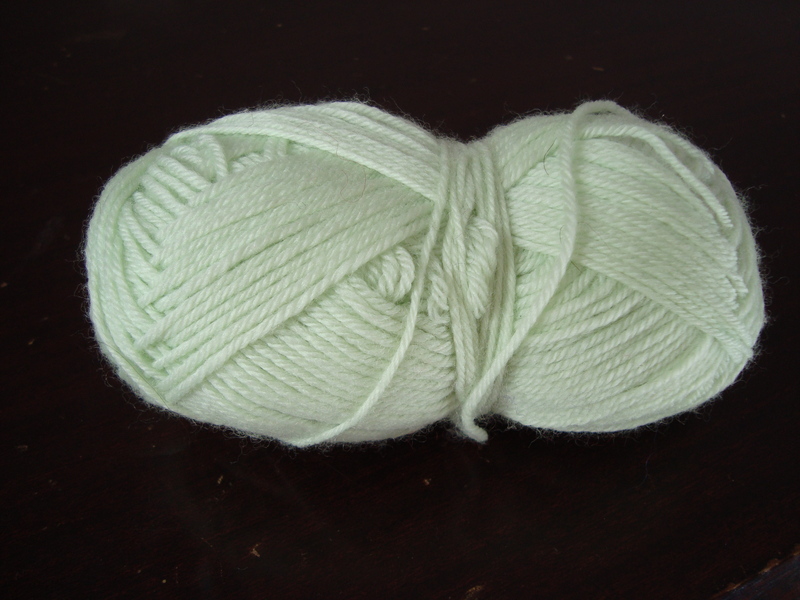 I’m planning a few more little knitting projects with a bunch of leftover wool I’ve got tucked away. I’d like to make some soft green merino socks for my little Angus Pie, using a pattern from this great book that my Mum gave me for Christmas. The wool is left over from a little cardigan I made for Angus when he was small. I’d also like to make my nephew Taika a hat and a little knitted square for his treasure basket, using some awesome bright washable wool left over from robot making. I have to attach backing fabric onto a blanket I’ve been working on since I was a teenager. 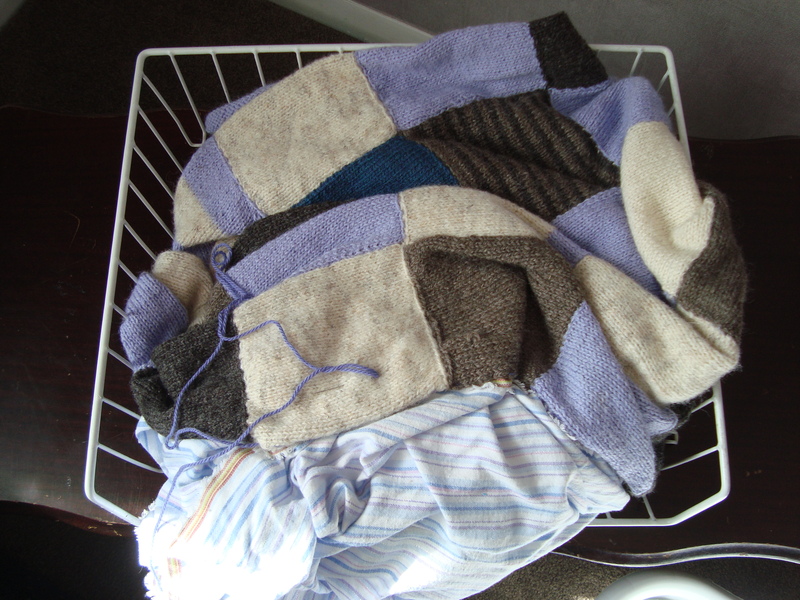 The blanket is made from patchwork knitted squares in natural brown, cream, burgandy and purple tones. 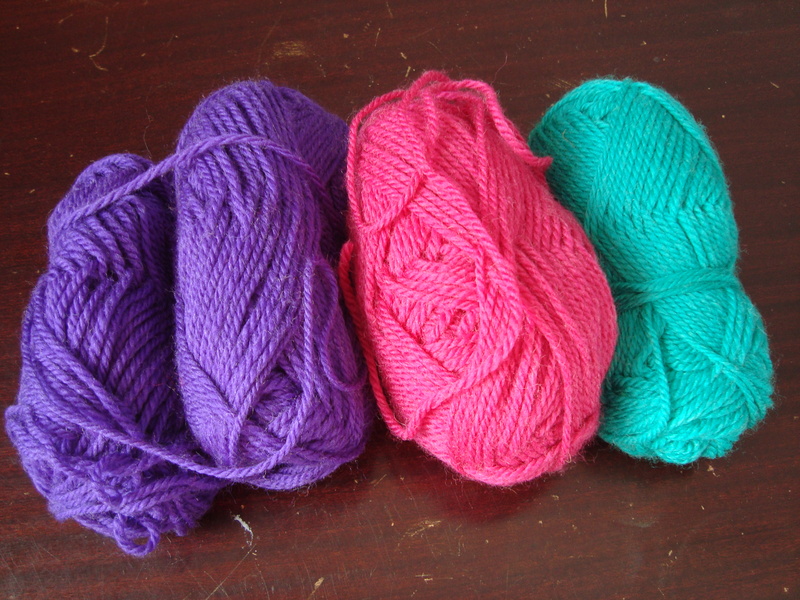 I’m also planning to knit a border for the blanket using wool that I spent hours recycling from an old jumper. 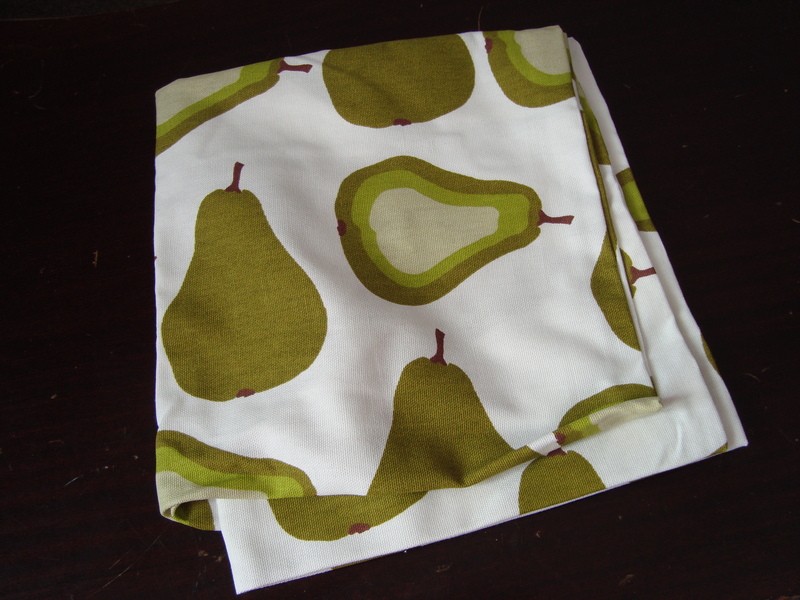 Finally, I’m going to make some fabulous pear cushions. My poor Mum… I asked her to get this gorgeous fabric for me for Christmas a couple of years back, then I only got halfway through making the cushions, made a little mistake then got grumpy and tucked them away in a drawer. They’ll look so cool on my couch when they’re finished and it’s not that hard to make cushions, so I’ll have to just get on with it. I’d quite like to stuff them with feather inners – I’ve recntly decided that they’re so much more substantial and satisfying than ones with dacron stuffing – so I’ll have to start hunting for some reasonably priced ones. Stay tuned for updates on these projects. And tell me – what amazing things have you got planned, or half-finished in a secret hiding spot? * The recipient of the gift has promised to send me some photos so I’ll post about it soon. Ok, other chatterbox sister?